The Fairmont Mayakoba is an enormous 45 acre parcel on the ocean. I was sold on the long drive from the lobby to my beach casita. Ferried by a golf cart, we wound through mangroves, over bridges, and under a rich canopy of trees. Butterflies everywhere, iguanas (we spotted 5 one morning en route to breakfast! ), colorful birds, and their native Coati (similar to a raccoon with a long nose) dot the landscape. Our room was gorgeous. Spacious with two queen beds, a terrace, dressing area with two closets, and a huge bathroom. I’m a sucker for a great bathroom, and Fairmont has it. Large shower, two sinks, and a sunken tub. Our first night we returned to the room to find rose petals on our beds and floating in a warm bath. My daughter was smitten and wanted to bathe with the flowers again in the morning. A warm Mexican welcome. Just another note on room amenities. . . custom blended Fairmont Teas, along with fresh ground coffee, a glass teapot and a French press are in every room. Again, my three year old was taken by the French press and had me making it every morning despite the fact I don’t drink coffee. Thankfully they include directions as well as a handy tea timer for ‘light’, ‘medium’, or ‘dark’. I have to mention the staff and specifically their top notch concierge. I arrived with a broken camera card and had a total meltdown (after all I can’t go anywhere these days without chronicling it for SJ’s Style Compass). They arranged for me to use a camera card they had while they sent someone to town to purchase me a new one. Meanwhile their business center staff noted I was using too high a resolution and was therefore only getting about 30 images per card (say versus 1000). Oh. Problem solved with a smile. The beauty of the Fairmont Mayakoba is that you don’t have to leave the resort if you are just looking for an extended weekend getaway. The Children’s Adventure Club was a hit with my daughter who had a chef experience one afternoon where they decorated chef’s hats and then made cookies. She even made and decorated a basket to tote them back to the casita. On another trip, she made herself a bracelet and a necklace for mama, with colorful beads. I wore it everyday. And of course the bikes! Bikes are located everywhere on the vast property, so feel free to grab one and cycle to lunch or the pool. I loved getting in a workout (ok, a workout SJ style) while stopping to see an iguana on the side of the path. The boat trip is a must. A guide takes you through the mangroves and canals pointing out a rosette spoonbill and a great blue heron. You may even get lucky and see a crocodile. Walk on the beach and sun in the sand. They have the whitest sand beaches that feel soft under foot. Once I entered the Willow Stream Spa I didn’t want to leave. They burn a coconut orange oil that smells divine, and they serve up pineapple and Chaya juice or hot tea. Upstairs is an open lounge with glass looking into the canopy of trees. I wished it would rain so I could snuggle up with a book and watch the rain. They were very accommodating even when this stressed out New Yorker (can I say that now?) asked for something off menu. No problemo. I relaxed into a 60 minute reflexology treatment. . . sublime. Part of my Mexican dream was the breakfast buffet. Pretty much anything you could want including local fruits and tasty aqua frescos. They blend a special ‘green’ juice that I had every morning. Don’t forget the Huevos Divorciados (two eggs over easy, one with spicy green sauce, the other with a milder red). How I love Mexican food! Saffron is a Thai restaurant located at the Banyan Tree Resort within the Mayakoba compound and definitely worth a trip. A stunning outdoor setting on the canals with delish Thai cuisine. You’ll think you were transported to Bangkok for the evening. 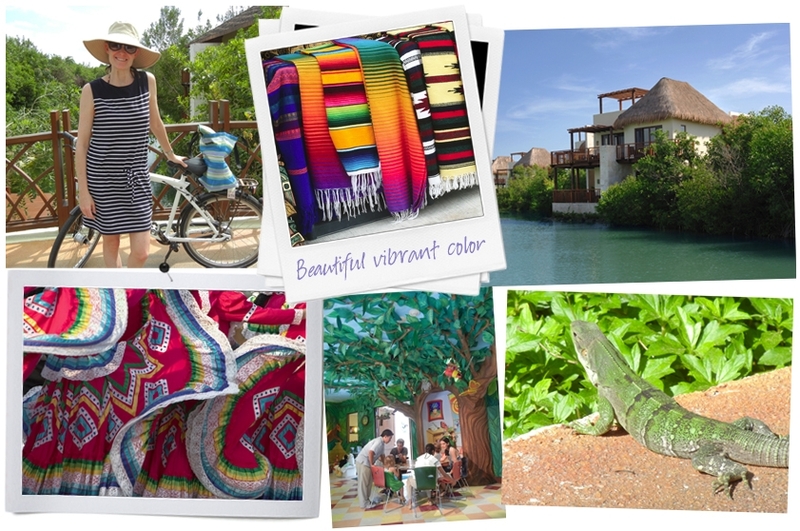 Stephanie Johnson is partnering with the Fairmont Mayakoba* to share this incredible destination. That’s right, we are giving away a trip (no, I’m not kidding! ), and some stylish SJ bags with which to travel. Look for details in an upcoming SJ’s Style Compass post and check in with our Facebook page for more info and how to enter. . .
*Special thanks to the Fairmont Mayakoba, for providing many of the photos used in this blog. I took the one of the dude on the beach!